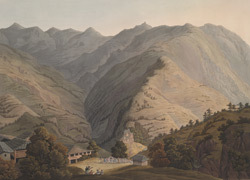 This coloured aquatint was made by Robert Havell and Son from plate 6 of JB Fraser's 'Views in the Himala Mountains'. The village of Kotgarh is situated upon a rock above the river Giri, a tributary of the Yamuna. It was reached by the party led by Fraser's brother William on 6 June 1815. They camped here, according to James, "in a pleasant grove of mulberry and oak trees", and were intrigued by a feline pawprint, smaller than that of a tiger or leopard. The local Rana came to visit them. James commented in his journal: "He was a very corpulent, sickly, ill-looking man ... unable from illness and fat to move himself, he was pulled up the hills in a sort of litter by 50 men."